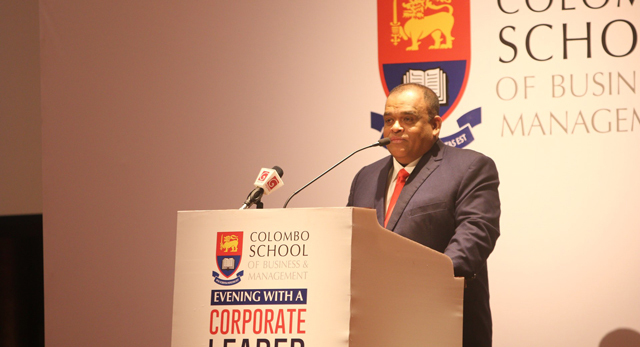 CSBM’s Evening with A Corporate Leader Dhammika Perera speaks about his Entrepreneurial Mind and the Leadership Heart. This event is part of a thematic series conducted through the year to facilitate and provide a platform for corporate leaders to share their experiences and milestones to a budding generation of young executives. This sharing will enable aspiring corporates direction, inspiration and an opportunity to network with future encounters of mentoring. This series was initiated to bring the top floors of corporates closer to the junior executive categories to make the mentoring process more realistic. This event is organized by the Colombo School of Business and Management and is usually held every other Thursday from 6-8pm at the Corporate Campus Premises, ward place, Colombo 7. The most recent speaker being the business magnate Mr. Dhammika Perera revealed the inner man in himself and the thinking behind some of his great successes. He included some real life examples of management with those who have approached him personally – looking for help, guidance or advice. He centred his sharing around the 10 principals within which he operates these are: Learn Something New every day!, Be A Good Communicator, Be a Problem Solver, Break down a big problem and solve it bit by bit, Ask plenty of Questions, Set High Standards, Prioritize, Have a passion, Practice a Holistic Lifestyle and Help Others. Mr. Perera shared management styles in the office, on a personal note and general wider perspective of life situations. He focused on happiness being a reflection of good management and unhappy employees being a direct reflection on bad management. Self-evaluation and staying within boundaries of ability with focused goals was another point of value he made along with researching the bigger picture, finding out global trends and how other businesses have handled certain issues. His emphasis was on learning from those who have already done it and succeeded when needed. Mr. Perera has a number of compelling example to share with 1000 plus audience – and one such story was his experience when at the transport ministry. A story of solving the accidental deaths of elephants that cross railway tracks. He discovered that the issue was in the frequency of sound the trains horn and the elephants hearing was on. The elephants were not hearing the sound of the trains horn. With the support of dialog and thermal censors this problem was resolved. And the number of deaths through train collision has stopped. Mr. Perera reflected on historic change through population increase and technological advancement and the tendency of people to initially fear change but later adapt and reap the benefits of it. He pointed out that religion and cultural differences have no place in the workplace and should not be brought within any framework of progressive management. Forecasting growth and planning ahead is also a sign of great management. Mr. Perera used the example of trees and the environment. Expansion is a foreseeable step to progression. If you envision your growth then begin by re-foresting knowing that in years to come you will need to de-forest in order have the land space to expand. Mr. Perera also emphasized the need to manage ones personal life eg. Family, parents, spouse and children. As the harmony of all theses will contribute to the triggered success of ones corporate life and career fulfillment. EWCL has been held for 18 months covering 33 sessions to include, Mr. Kishu Gomes(Chevron), Mr. Ashok Pathirage (Softlogic), Mr. Kulathunga Rajapakse (DSI), Mr. Dilith Jayaweera (Derana, Triad, George Stuart), Mr. Nandika Buddhipala (Commercial Bank), Mr. Sunil Wijesinha (United Motors, Watawala Plantations), Mr. Ranjith Pandithage (DIMO), Dilanka Jinadasa (Hela), Dr. Rohantha Athukorala (Sathosa), Dulith Herath (Kapruka). Mr. Dilshan J. Fernando, Director (Dilmah), Mr. Wegapitiya, Chairman (Laugfs), Mr. Dian Gomes, Chairman (Hela Clothing and CSBM), Dr. Hans Wijayasuriya, (Dialog), Mr. Sumal Perera (Access Group) to name a few. The next speaker to feature will be Mr. Ashroff Omar, Ashroff Omar, Group Chief Executive Officer at Brandix this will be on 16th March 2018 from 6pm at CSBM corporate Campus, Ward Place Colombo 07. This is organized as a free event CSBM will require interested participants to prior register for the event.